Deliver happiness into the lives of the special people in your life by sending this Impressive Gift of Shoppers Stop Vouchers along with Love Chocolates and Golden Rose and create a magical world full of love for them. This Gift Voucher is also presented along with 3 Pc. Heart Shape Homemade Assorted Chocolate, 1 Pack I Love You Chocolate (25 Gr. 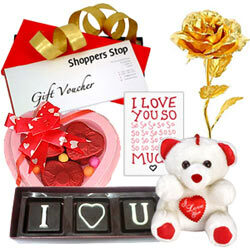 ), I Love You Singing Teddy, Golden Rose and I Love You Written Card.